I really shot myself in the foot this month for Mixology Monday. Kidding around thinking Midori would be a fantastic ingredient for this month’s theme: From Crass to Craft – hosted by Scott Diaz of Shake, Strain & Sip, I soon discovered I was having quite the time trying to actually make a ‘craft’ drink I could proudly show off. 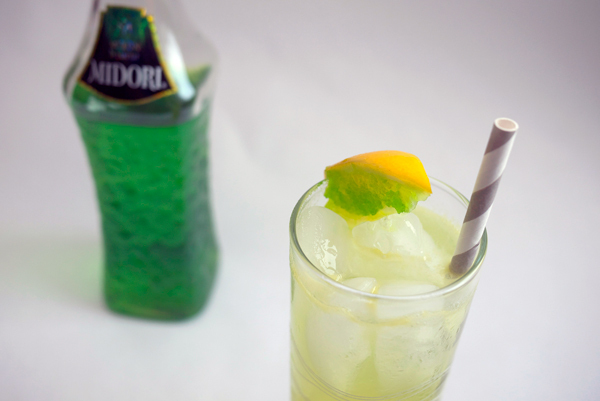 In my mind there is a strong memory of Midori being one of the first liqueurs I ‘made cocktails’ with. Sophomore year of high-school there was one memorable night where a friend’s parents had gone away and several of my girlfriends and I showed up and raided the liquor cabinet. I don’t recall how I knew of the recipe, but I do remember there being a drink of orange juice and Midori. Perhaps its pretty colors, perhaps there not being much on hand, I remember drinking those until I was quite possibly intoxicated. No, wait. I’m also remembering a bottle of Rumple Minze too. Regardless, I don’t think I’ve touched a bottle since then and there was a small part of me that wanted to try it again for the first time as an adult. And really, it’s quite a crass one with it’s ‘melon’ bubblegum smell and OH-SO-SWEETNESS hiding there under a lovely shade of emerald. But dang, OJ and Midori was not going to cut it for “Craft”. Let’s talk about procrastination shall we? As I mentioned in my last post, I’ve become fascinated/kinda obsessed with dehydrating liquors and finding ways of using them. 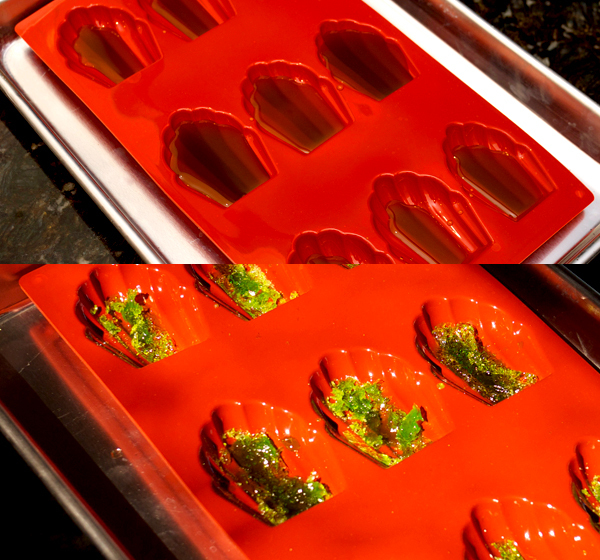 So before I even came up with an inkling of a recipe, I shoved a tray of Midori in the oven and let her go. I had much better success this time around than with the Baileys. After 24 hours the Midori formed these neon crystals that looked like crumbled rock candy. But alas, I still couldn’t think of a recipe to go with them. Until now. Part of the fun of thinking up new cocktail recipes is just going through lists in your head of flavor combinations (well, it’s fun for me). Sometimes when I have an ingredient I want to use, but not sure how to, I turn to flavors in cooking (or baking) I would use with it. This usually helps me through a roadblock. In this case I also had a black pepper syrup that I had been dying to try out in something and thought “melon and black pepper”- hey, they could work! Altering the recipe for a Tom Collins, I was able to work in both the Midori and the black pepper syrup into something I really *gasp* liked. 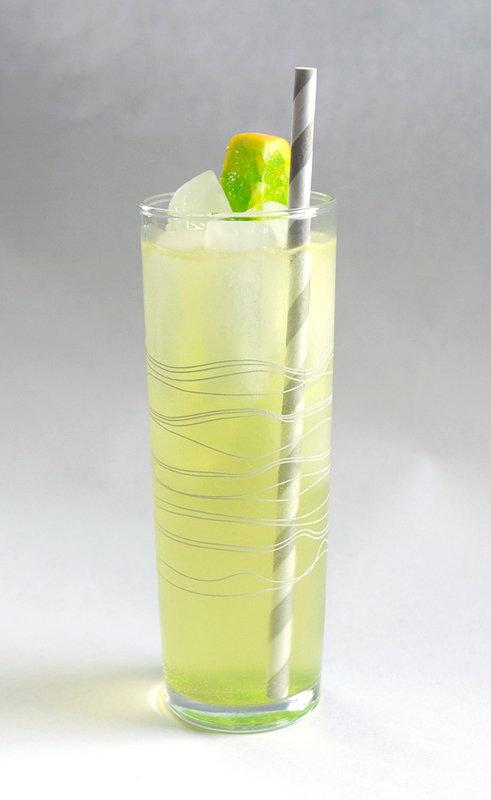 In a Collins glass 2/3 filled with ice, build your drink by adding the gin, Meyer lemon juice, black pepper syrup and Midori. Stir gently and top with tonic water. 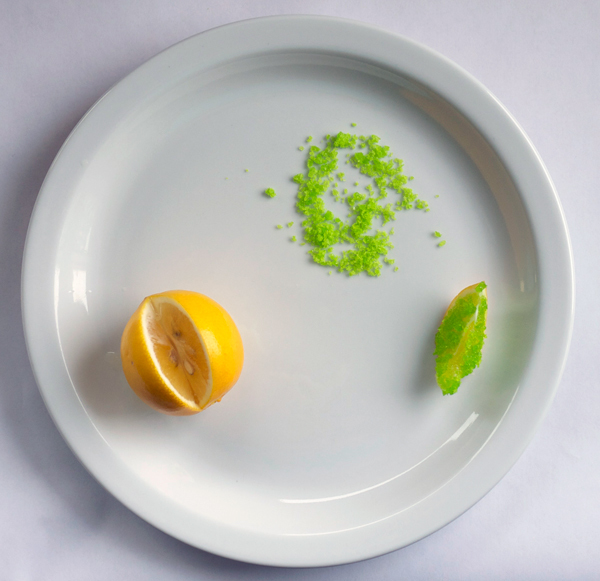 Garnish with a lemon slice rolled in dehydrated Midori. Admittedly I did find this refreshing. It leans on the side of sweet with a sharp tart tang while the black pepper syrup grounds it with a subtle earthy layer. The melon is mellowed out by the sweet acidity of the Meyer lemon juice while the tonic helps the ingredients move throughout the drink. I probably wouldn’t have two right after another, but just the one drink worked out in the end for me! Done. I haven’t sweated over an assignment this bad since college. Thanks to Scott for hosting this month! Heat all the ingredients until boiling. Remove from heat and let steep 15-20 minutes. 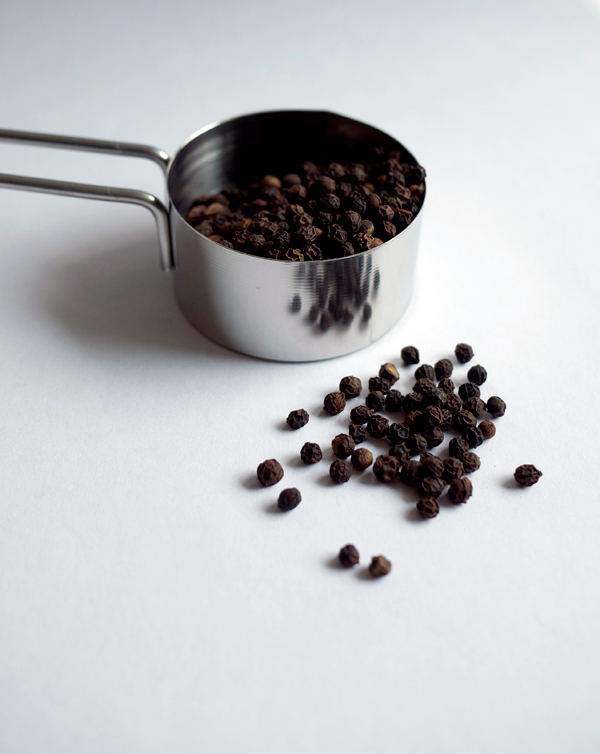 Strain peppercorns out and allow to cool. Once cool, fine strain and bottle. Keep refrigerated for up to a month*. *Since I didn’t see myself using this daily, I also added a 1/4 oz of vodka to the mixture and refrigerated it. This will probably keep it safe in there for at least 3 months. Set oven to 170°. In a silicone container (I only had on hand a silicone Madeleine pan ), evenly spread out the Midori. A baking sheet underneath will help keep it steady going in and out of the oven. Place in oven. At the 17 hour mark, take Midori out and break up chunks in the container by squeezing the container around to expose any wet spots. Place back in oven and continue to heat until a full 24 hours has been reached. After 24 hours, take the sheet out of the oven and break up pieces again and allow to cool to room temperature. Remove crystals and either place in an airtight container in the fridge, or grind with a mortar and pestle if using immediately. And here’s the roundup post! haha! Was waiting for yours! Looks pree-ttee as always but I’m not sure im sold on midori just yet. Even with such a classy concoction. Cheers! Ha! A quarter ounce was just enough for this drink. Promise! Congrats! Glad the Midori worked out after all.. so pretty. Also love the inclusion of the black pepper simple – which, I learned a couple of days ago, is delicious in mint juleps too. Thanks! And OH MY, I will have to try the syrup in a mint julep. Also because I just have SO much of the dang stuff now.